Out in the Gulf BP are going through the preparations for the next stage in the attempt to top kill the deep water well that has been leaking oil and gas for more than a month. The kill attempt has now been underway for a couple of days, and so this is initially a recap on what I believe has happened to date, and what they are currently planning on doing. I will include in this explanation the two attempts that BP have made so far, and what I expect that they will do next. 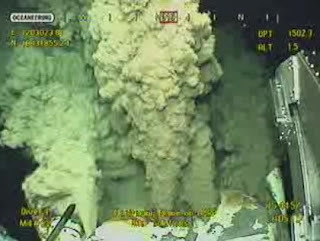 UPDATE: (9:19 PM) There have been at least two and possibly as many as four times today that there has been something that looks like an explosion, and debris rains around, and for a while the ROV cameras go and look at something else (right now it is the riser outflow that we haven't seen for a while). What I believe is going on is that BP is running a series of "junk shots" with the Nat Lab "junk", and after they run one they fill the well with mud to see if it has changed anything. To date, while there are changes (you stop doing this when there aren't) they haven't been enough. But after each time that they fill the well with mud, they switch the pumps off while they go and regroup. That allows the gas and oil to push the mud back out of the way (one of these tries, perhaps, it won't and we will know that it has worked). But when the oil and gas get through the constriction of the BOP there is a drop in pressure and an expansion, and this gives that little bit of excitement that we see. After a while, not so exciting, though this time one of the cameras went off air, so maybe there was something else going on as well?? 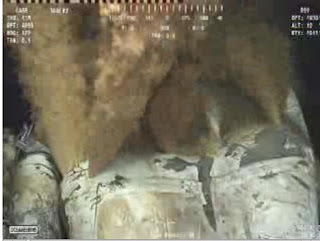 OH, and BP has decided to halt, for a while, the second drilling of a relief well, so that they can prepare for plan B. One has to remember that these drilling rigs are at a premium, and there is an opportunity cost with just about every decision. "The (Developmen Driller II) has temporarily suspended drilling operations in preparation for the possible future deployment of its BOP on top of the (Macondo) BOP," he told UpstreamOnline in an email response. UPDATE 2: 10:53 pm. It appears that they are pumping mud again, so another test may be under way. (I am judging this on texture and jet structure) . There is one interesting thing to note, and you have to be familiar with the patterns to see it. So I am going to repeat a picture from 3:45 am yesterday (which has been my standard base reference for mud, rather than oil flows. Notice the changes in the flow pattern, and particularly that the crack to the right of the central paint removed line, which had a piece of rubber jammed in it . By adding more NL junk they have just about totally bridged that crack and stopped the flow - which illustrates that what they are trying to do at the BOP is at least partially working - as I explain below. In fact, after watching for a short while, both the central jets that used to carry most of the flow, are now significantly diminished, so both have some form of particle bridging the gap. I am almost tempted to note that the flow seems at a little less pressure, judged again by jet structure, and which would indicate more bridging in the BOP, but I grow more cautious as the process extends. To help with the explanation I am going to use some very simple models, which oversimplify the situation, but hopefully help in explaining it. To start with I am going to break the overall system down into a very simple diagram. Basically BP are sending mud through a series of feed lines, which I have simplified for the explanation into one feed pipe that I have called the choke line (grey). It has an internal diameter, at most, of 3 inches. (I say at most because most fittings on these lines have smaller diameters). It feeds into the top of the well, which I have colored brass, and which is the pipe (casing) that feeds from the seabed down to where the oil is emerging from the rock, some 13,000 ft further down. The casing and choke line sit underneath the Blowout preventer (which is the large assembly at the top of the rig). I have colored this bronze, and simplified the shape, for this explanation, to represent a pipe that has been partially closed by the action of the BOP. Now, here is the problem. BP want to feed mud through the choke line at such a pressure and flow that it will push the oil and gas flowing up out of the well back down the well. To do that they have to create enough resistance to the flow that the combination of the mud flow and the oil can’t all escape out through the hole in the BOP. They can do this since, as you increase the flow through a hole (or nozzle) it has to move faster to get through the space in a given time. It takes a driving pressure to get the fluid moving at that speed, and for a given driving pressure the fluid will only move at a certain speed, and so only a fixed volume of fluid can go through the hole. Thus if BP pump more fluid into the well than this volume, for that given pressure (which is higher than the pressure that the oil was flowing at) then all the flow out of the well will change to mud, and the excess mud that is not flowing out of the hole will be at enough pressure over the oil (and gas) in the well that it pushes it back down the well and back into the rock. Now that was the first step. The idea was that once the column of mud filled the well, down to where the rock reservoir lies, that the weight of the mud would exert a pressure on the oil in the rock, that was higher than the fluid pressure, and the flow would stop. The first time they did this, the density of the mud (weight of a cubic foot) was not high enough for the full column to balance the pressure in the rock, and the leakage of mud out of the hole in the top of the BOP was higher than BP had thought, so they were losing too much mud to the Gulf. So they moved to step two. The first part of this is to try and reduce the size of the hole in the BOP. And for this they used a variety of what everyone is calling a junk shot. It actually isn’t. Given the problem that I am about to outline, they have an ally that folks normally don’t have. As Secretary Chu has pointed out there is the full intellectual strength of the Federal Labs behind this attempt, so where one would normally just chop up tires and similar materials, there is a fascinating mathematical problem in designing plug pieces of the right shape that will fit the constraints, and which will accelerate the blocking of the flow path. So I suspect that some of the shapes that will appear in the flow, will have been specificially designed for the problem. Not being familiar with their answer I’m going to stick with the spheres and triangles of the more traditional, shall we say old fashioned, way of addressing the problem. It is one of these problems where the bounding conditions can make life rather difficult. Let me redraw the problem with a different orientation. What we have to do is to block (the term that is being used is bridge) the passage through the BOP. This will stabilize the flow, and will allow the cement plug time to set up. (We’ll talk about cements another time). So here is the slit: through the BOP – it is going to be a more complex shape, but this allow some explanation of the problems. Now to block the slot we have to have some pieces of material (although they are quite large for simplicity I am going to call them all particles) that are big enough to wedge in the slot, but small enough to get through the feed lines to that point. Now here’s the first catch, we don’t want them to be hard enough that we will damage the passages, nor soft enough that they will bend distort and compress and squeeze through the hole. Rubber turns out to fit the bill, and though there are other materials that could be better, in this initial explanation that’s what I am going to use. The easy thing to do is to use some spheres, not easy to get, though golf balls are an example. Unfortunately they are a bit too big. The reason is that the feed line through the choke has a maximum inner tube size of probably 2.75 inches. A golf ball is about 1.6 inches, which is more than half this, so that two balls together could block the feed line – a definite no-no. (And don’t say it can’t happen, I’ve seen it with smaller particle ratios than this). See all the open space around the spheres, and how much of the slot remains open. 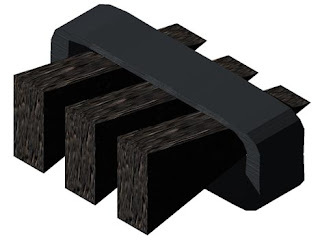 We really haven’t made much of a blockage in the slot area of contact, and we have made it hard to push other materials into the slot area itself. However the smallest open area now may be at the maximum diameter of the spheres, which is further back, where the feed pipe is larger. 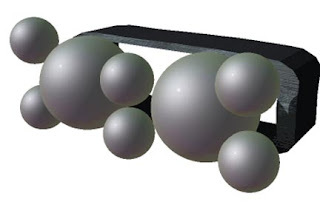 Putting more spheres of the same size down won’t improve the situation much, because they still leave room, around the spheres, for fluid to flow. There are two ways to go, once the initial building blocks for the bridge have been established. The first might be to use triangular pieces of rubber (as we saw protruding from the crack in the riser. 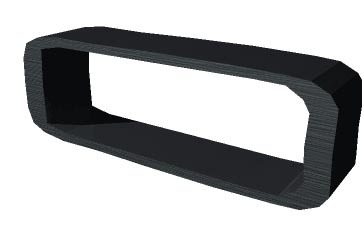 These can fit closer together and fill more of the slot and flow passage. Here the strips have aligned in the right way and have been driven into the slot, reducing the flow path. But note, as with the spheres that the gaps that are left are now too small for more strips of that size to feed into the slot and do more blocking. 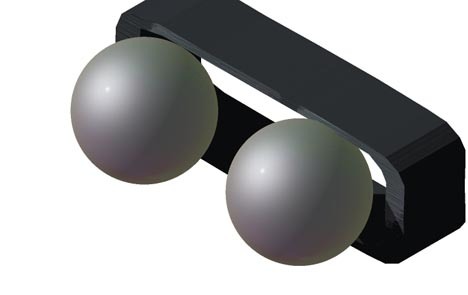 Filling the gaps with a smaller second set of spheres. So now the gaps that remain are even smaller, and so in a third shot, with even smaller gaps the feed particles have to be even smaller. 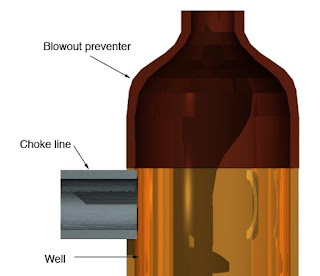 It can take a number of different slugs of material going through the choke line (and being pushed into the BOP instead of falling down the well, before the slot is sufficiently “bridged” that there isn’t much flow out of the BOP. So expect that there will be a number of these shots, after each of which mud will be pumped in to see how much progress in filling the holes they have made. Bear again in mind that there is this restriction on how big a piece they can feed in, and just hope that all the gaps in the BOP are small enough that big enough particles can be fed into the lines to block it. Now, as I said, they are probably using more sophisticated shapes from the National Labs, that will allow the number of shots to be reduced, but the relative sequence still has to be followed, as they build the bridge. Let's see how it goes, and be patient, each shot takes time to set up. And at the same time, given that they have to balance the weight of the column of mud against the rock pressure, they are using the interval to change the mud weight increasing it each time, to seek that balance. (They don't want it higher than it has to be or it could hydraulically fracture the rock and lose the mud into the crack). (Oh and if some of you remember the class in school where the teacher filled a jar with big pebbles and asked you if it was full, you said yes, then he/she poured in smaller pebbles, now is it full? Then came sand - now is it full? And then the jar was filled with water - its the same basic idea).